This is an artwork by Kelly Rae. I always pause video streaming and let it buffer first before watching it. Pause is just a mere temporary discontinuance of something. Similar to me, I am slow in updating my entries. It has been almost 2 months since my last post. It has been more than a year already since I left the corporate. Before resigning, I calculated if I can manage being jobless for the meantime. Based from my minimum savings account, I could not. I went back home. I did managed to survive until now. God is really gracious that He continuously provides for us. We are not rich nor live a luxurious life. But for me it is enough. More than enough. 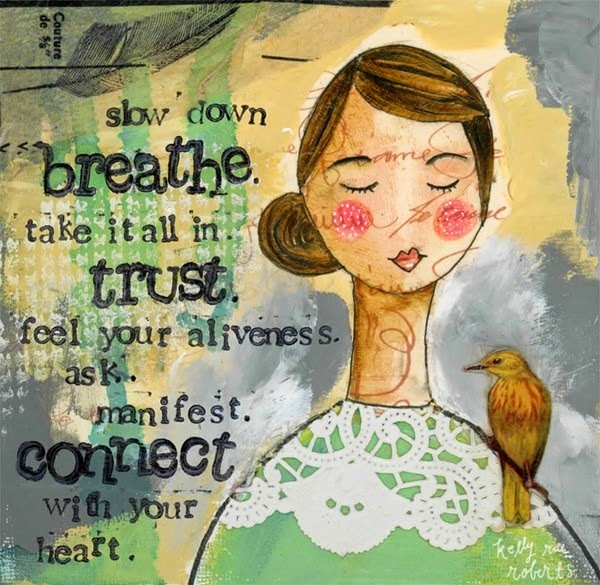 As I continue my second year of slowing down, I am pursuing simultaneously things I feel that I want. I am still praying to God if it is here where He wants me to be. Last year, I realized that I have to go out of my comfort zone. I did and I learned a lot about people. However, the time there was really slow and I got bored. It was around this time also. Now I am way too far from my comfort zone. The travel time is three times longer but I am enjoying every single bit of it. I am happy. I felt peaceful. But then I realized it is similar to my college home. The atmosphere is almost the same. I might just be feeling nostalgic. I kept asking God, "Is this it?" I think I need to learn how to properly listen to what God is telling. But it is very challenging. Why do I have this feeling of being in a comfort zone away from my comfort zone? It is only my second week in this new environment, yet it feels homey already. Of course, I knew how to differentiate the homey from unhomey. I have used many "feel" words already. I just want to vent this out. I pray that God will continue to guide me in this lifetime journey.